I’m very annoyed. I had an entire article on Aether Revolt’s Modern impact planned when, without warning, all my Magic-related social media exploded. Wizards had moved up the Banned and Restricted Announcement to Monday. Oh well, looks like all that effort was wasted—time to analyze some implications! Not that I’m actually complaining about the bans, mind you. Monday’s announcement is most welcome, if a bit surprising. Personally I like the policy changes. The delay between when spoilers finished and the B&R changes were revealed was very close to wasted time, seeing how you didn’t know if anything you tested would ultimately be relevant. Having more announcements per year will ultimately be positive as well, despite having to deal with the rampant speculation more often. Additional announcements allow Wizards more flexibility when problems (like, say, Eldrazi Winter) arise, and should help prevent similar situations from arising again. All in all, an improvement. The scale of the announcement was also surprising. Standard has been in serious trouble for some time now, but I never expected three bans there. One, possibly two at most. This really speaks to how desperate Wizards is to get players back into Standard. But, as this brick that just flew through my window reminds me, this is Modern Nexus so let’s focus on the banning of Gitaxian Probe and Golgari Grave-Troll. Gitaxian Probe increased the number of third-turn kills in a few ways, but particularly by giving perfect information (and a card) to decks that often have to make strategic decisions about going “all-in.” This hurt the ability of reactive decks to effectively bluff or for the aggressive deck to miss-sequence their turn. Ultimately, the card did too much for too little cost. This is entirely correct. The unmentioned “few ways” included free prowess/Kiln Fiend triggers, a card to delve to Become Immense, and free storm count. More subtly it let you make looser mulligan decisions since you had a free draw step, which was more potent in unfair decks. The card was simply unfair and we are better off with it gone. While they didn’t single out a specific deck, it is clear that Wizards was referring to Infect, Death’s Shadow Zoo, and Kiln Fiend combo decks. All these decks are what I call gotcha! decks and as I mentioned they are problematic. If you dislike this kind of deck then the Probe ban was the best thing that could have happened because it was an archetype staple. Not deck staple, archetype. Free information is good and free cards are better. This should help slow things down in Modern. I expect this ban to work because there are no substitutes for Probe. No, Peek is not a substitute. I know it looks like one but it isn’t because you must pay mana. Probe’s appeal was that it cost no mana. Mishra’s Bauble is similar but not nearly as valuable because the information is limited and the draw delayed. As a result there will be a permanent hole in the gotcha! decks which will make them less appealing and consistent. Infect: I’ve done some goldfishing with a Probeless deck (adding in more pump spells) and it feels a half-turn slower. As it goes for all these decks, you have to mulligan more and you have to guess when to go for it, but for Infect specifically now you have no cantrips to find more spells. You could run Serum Visions but that feels like it slows you down more. As a result you’re a little more vulnerable to removal. I also had to work harder and risk more resources to turn on Become Immense. Not by a lot, but by enough to be noticeable. Still a scary deck, but maybe not too scary anymore. Death’s Shadow Zoo: The ban will have a much bigger impact here, where Probe was better than a simple cantrip and often generated virtual card advantage. Between taking off two life, adding a card to your graveyard, triggering prowess, and getting perfect information, this was an insane amount of value for no mana. Nothing else compares. That aside, it will force a major rethink of the deck’s construction. Between Probe, Street Wraith, and Mishra’s Bauble, the deck was effectively 48 cards. This let them really skimp on lands and greatly increased their consistency. Now they have to fill one of those empty slots with a real card. This will force them to rethink the land count at minimum. Cantrips replace lands to a degree and now they have fewer cantrips so they need more land. With more “real” cards in the deck, it will be harder to find what you need, making the deck more likely to lose to itself. It also makes it less likely you will turn on Death’s Shadow early. Will it kill the archetype entirely? Maybe, maybe not. It will give you some incentive to play a more normal Zoo deck. UR Prowess: Probe was a keystone card in this deck. In addition to all the reasons from the other decks like prowess triggers, it “primed the pump” to flip Thing in the Ice while cantripping. There are enough cheap instants and sorceries that I expect the impact will be small, but now they’ll be playing with less certainty and flipping Thing will be harder. It will also be harder to go nuts with Kiln Fiend, possibly enough that they ditch Kiln Fiend altogether and become a UR midrange deck. And I’m fine with that. If you look around the ‘net at all, you’ve almost certainly seen the entire spectrum of reactions by now. From anti-Infect partisans raging that it wasn’t Become Immense to Storm stalwarts lamenting their undeserved oppression, I see a lot of players who aren’t okay with this ban. The majority are, but there is always dissent. While I acknowledge that there are undeserving decks harmed by this decision, I do believe it was correct. The gotcha! decks needed to be taken down a peg and Probe was the key feature in all of them—in many ways it was the best card. If Infect and Death’s Shadow continue to be too strong even with this gone I could see an argument for Become later on, but not now. Probe will always be at its best in less fair decks. Yes, it saw play in fair decks as well, mostly to enable Young Pyromancer, but it was never as strong. Probe let you see what, if anything, you had to play around or prepare for, and plan your sequencing exactly correctly. There’s “correct” sequencing based on matchup knowledge and playing around problem cards, and then there’s actually correct sequencing based on what your opponent actually has. Knowledge of how to correctly sequence a turn has always been more powerful in unfair decks than fair decks because they will kill in a single turn and need to know when to go for it (which doesn’t really count as “going for it” when you know it will work). That power for free is simply absurd. As a result, Probe will always benefit unfair decks more than fair decks and so the damage to fair decks is unfortunate but acceptable. I also remind you that Wizards prefers to ban enablers, not strong cards. Become Immense is strong, maybe too strong, but you have to set it up. It is now harder to do that because you have to pay mana for everything and it’s harder to chain spells. You also don’t know if it’s safe to pull the trigger anymore. The right decision is to depower first and reevaluate its power. If Infect is still too good in March, then we’ll talk. Dredge, the mechanic and the deck, has a negative impact on Modern by pushing the format too far toward a battle of sideboards. With the printing of Cathartic Reunion and Prized Amalgam, the deck once again became unhealthy for the format. While those cards were discussed, the real offender always has been the dredge mechanic itself. Consider this: dredge the mechanic allows Dredge the deck a level of consistency that other graveyard decks cannot match. Grixis Emerge in Standard is effectively dredgeless Dredge, and it isn’t very good, arguably in Standard and definitely in Modern. Amalgam and Reunion are okay on their own. It’s in the presence of dredge that they become troubling. Remember, ban the enabler first. If it’s still a problem, kill the card later. This will not kill Dredge outright. The deck will still function, just not as fluidly. If you want to dredge more than three cards you now have exactly Stinkweed Imp at five and Golgari Thug at four. This will slow the deck down and reduce both its explosiveness and resilience. They’re less likely to dredge into threats or answers now, and if they’re forced to play a fair game Thug is a much worse creature than GGT. I expect to see Dredge fall off but not completely disappear, and that’s fine. And now, onto the truncated topic I was planning for today. It’s strange. For the first time, the spoiler is complete in time for my set review. This was an aggressively short yet exciting spoiler season. There is one very obvious card that I won’t be spending much time on because it has been discussed to death, but there are also a number of less obvious and largely undiscussed cards as well. Those are the ones I will be focusing on today. Now there are plenty of strong cards, particularly some undercosted green beaters, but I think their impact on Modern will be limited. Mono-green Stompy is a fringe deck at best and I don’t see anything changing that reality. Rather, there are some interesting new mechanics and a whole lot of combo cards to discuss. The cycle of Expertise cards are interesting. They are effectively fixed cascade spells. Cascade was a trigger that cast an additional card when you cast the spell. Now that extra card is dependent on you having it in your hand and on the initial spell resolving. In exchange you get to choose what to cascade into. As a result I don’t expect any of these spells to have much of an impact. You were playing the cascade spell for the trigger in the first place (which is why Bloodbraid Elf was the best of the bunch—it was a reasonable card by itself) but with Expertise you really need to want the card itself. And they’re all pretty meh for Modern. The red one, Kari Zev’s, is costed for Modern but the effect isn’t really Modern-playable. effect is the most playable, but it’s directly competing against Damnation and I don’t think it wins. I realize that these can be used to play CMC-less cards that you draw rather than cascade into like Living End or Restore Balance. My question is simply do you actually want to have these safety valves in your deck? Living End doesn’t want ; it would put opposing creatures into the graveyard. Kari Zev’s looks like the most likely candidate, but if you don’t draw your uncastables, do you really want that card in your deck? I have doubts. There is little new for me to say about revolt itself. If you want to go in-depth, go read Ryan’s article on , the card that everyone else has lost their mind about. I agree with Ryan’s assessment and only have this to add: what do you cut for Push? Obviously Disfigure is out of a job now, but that card didn’t see much play. So what goes? If you cut unconditional removal like Murderous Cut you lose to Primeval Titan and Reality Smasher. If you cut something like Lightning Bolt you lose flexibility. So what will be sacrificed for this card? More interesting to me is another black revolt card, . Remember, revolt looks for any card, so Rebel plus Eldrazi Displacer can machine-gun your opponent’s entire board (mana willing). Will this be good? I don’t know, but I do know that it will be more reliable than Wasteland Strangler. And you never have to target your own creatures. Keep an eye on this card. Finally, I want to highlight . It looks innocuous, but my inner Craig Wescoe is giddy at the sight of that card. Alongside Aether Vial, this card is a recovery engine. I have visions of Vialing in Rallier following Supreme Verdict, getting back Voice of Resurgence and then using Flickerwisp to do it again next turn. Is this good? Maybe. Will it be fun? Oh, yes. This is the mechanic that has the most potential for bustedness in Modern. It works like convoke for artifacts, but you cannot reduce a colored cost. This appears to be weaker than convoke but these are artifact we’re talking about. It isn’t hard to flood your board with them, meaning you can pretty easily pay for a lot of improvisation. The most powerful improvise card for Modern is probably . Tutoring for artifacts has been busted before (Tinker) and while this is not quite that powerful, it is pretty ridiculous. Eggs was a super powerful deck in the past that led to a banning, after which it has been held down partly by Stony Silence and partly by its own inconsistency. A Chord of Calling for artifacts is just what the doctor ordered for Eggs to fix that second problem. It already has access to Reshape, but for any tutor target other than Lotus Bloom, Whir will effectively cost less mana (and forego the required sacrifice). Eggs is getting other tools as well (the Implements, for example, which fit perfectly into the deck’s game plan) and I’m sure somebody will discover the optimal configuration before long. We could also conceivably see an entirely new combo deck arise on the back of . Wizards has printed a lot of artifact combo pieces in Kaladesh block, and Whir is the perfect way to find whatever piece you were missing to go infinite. Much like Abzan Company and Kiki Chord use Chord to assemble two- or three-card creature combos, we could see a new Whir deck that does the same with artifacts. At this time I’m not sure what the exact combo would be, but there’s no shortage of weird, comboy artifacts in Kaladesh block. Consider . This could be infinite mana coupled with mana rocks, or infinite improvisation. Five mana is a lot, but it isn’t that hard for a dedicated combo deck to generate that while going off. I don’t know how well that would actually work in practice, but the potential is there. 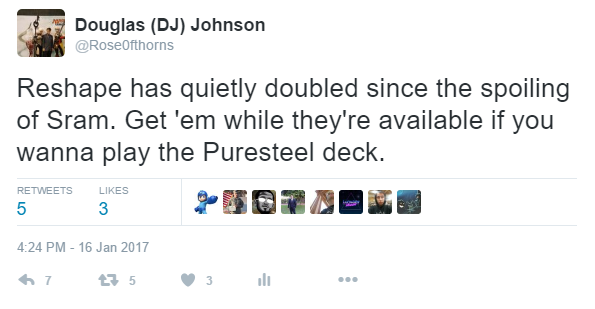 Then there’s Cheerios, the Puresteel Paladin combo deck, which played 0-mana equipment and Retract to generate lots of storm. The deck was previously very bad because most of the deck was actual air, and without Paladin or Monastery Mentor in play it did nothing. It also lost to Chalice of the Void on zero and Thalia, Guardian of Thraben. Now it has to act as another Paladin, so it is less prone to failure than before. Still loses to Thalia and Chalice though. One combo I am not expecting much from is Saheeli Rai and . Yes, I know it looks like Splinter Twin. No, it is not Splinter Twin. That combo was good because it could happen at instant speed and protect itself. Guardian and Rai must be played at sorcery speed and will be left in the open if you want to combo before turn seven. Another problem is that Twin combo was made of reasonable cards. Exarch was a decent disruptive card and blocker when needed, and Twin on Snapcaster Mage was an impressive value engine. Saheeli is not Modern-playable outside of combos and Guardian really isn’t a Modern card. Maybe it will be good in Standard but it just won’t fill the void the banning created. Let it go. Finally, I’d be remiss if I skipped . A Bramblewood Paragon for all decks, this card is definitely cheap enough to find a home in Merfolk. The fact that it becomes one is another positive. I also like that the boost is a counter which is valuable should Mimic eat removal. The question is what to cut to make room. You need to have it early to pump anything, but Merfolk lists are pretty tight and I don’t think it replaces any “normal” Merfolk. Phantasmal Image seems an easy cut but beyond that I’m not sure. It could be that the extra redundancy is enough that you want a full playset but I’m not convinced yet. I will be trying the card soon, you can count on that. Between the bannings and the new cards, I expect quite a few shake-ups by the time Regionals and GP Vancouver roll around next month. I’m also very relieved that nothing was unbanned yet. I’m still testing Jace and would have been upset if that article was no longer possible. As it has been pointed out, Wizards has frequently banned something at the beginning of the year and then unbanned something later, so look to March for the hopeful return of Preordain. Losing Probe makes your mulligan decisions easier, not harder. Probe represents a random card in your opening hand. As for speed and consistency… well, you’re going from a 56 card deck to a 60 card deck, so each piece is less common. You’ll have a slightly lower concentration of infecters, but a higher concentration of pump spells (based on proposed changes from players like Tom Ross). Assuming you have your infect dude, you’re probably goldfishing slightly faster. So basically, the deck is a bit better against lightly interactive decks, and a bit worse against the interactive decks. Part of this argument is also that Become Immense is better against something like BGx than against Tron. Agreed on pretty much everything you said. The only card I’m less bullish on than you is Vengeful Rebel, since a big part of E&T’s shtick is basically removing the “give your opponent their card back” clause from Tidehollow Sculler and Flickerwisp, which mostly means that Vengeful Rebel is only better than Strangler if there’s a Displacer on the board, which feels a bit corner-case. The fact that it can’t be slammed out faster with Eldrazi Temple and can be protected against (because it doesn’t have devoid) make me think it’s not quite good enough. A card I am bullish on, however, is Renegade Rallier. That card is going to be spectacular in GW Death & Taxes. I’m sad to see Gitaxian Probe go mostly because I played it in fringe combo brews for it’s “56 card deck effect” but mostly because it hurt poor storm players who keep getting the shaft. I’m surprised anyone still plays that deck and when I see someone that is a die hard and still does I shake their hand. But if they are going to ban Gitax for its speed and consistency then why didn’t Mox get the axe? I can’t think of any other deck that is hellbent turn one. Anyways as for the GGT ban: Was he enough? They said they were going after the dredge mechanic itself. I guess the better question is: What did WOTC set out to do when addressing Dredge? Was it to obliterate it completely? Make it tier 1.5? What? Just where they say they were targeting the mechanic itself I think if they really wanted to make dredge hurt Stinky should have gone too as well. Artifact hate is a way of life in Modern, which keeps Affinity down, meaning that a ban there is unwarranted. You can beat Affinity’s busted draws by normal interactive means, so there’s no reason to act. The only way that Opal gets axed is if Lantern or a combo deck start really gaining metagame share. If they’d banned Stinkweed too I don’t think there is a Dredge deck anymore. I’m ok with that, but I don’t think Wizards is. I think they just wanted to weaken it enough that it falls out of Tier 1 and players don’t have to run so much graveyard hate, which this should accomplish. If it doesn’t then they may get more aggressive later. So, that’s it. No testing, no assumed potential? Copycat ( felidar rai) is an aggressively costed, two card combo. Forget comparing to twin. A little objectivity would be more sensible. You say the cards are unplayable as if Splinter Twin the card was literally instant speed and was playable without combo. No seriously, you make valid points. I just feel your being a little too dismissive. Consider the etb synergies with vendilion clique, snap and pia kiran nalar. Not that these are broken but most definitely not useless alongside an instant win. If you want objectivity, do the testing and prove people wrong. Don’t get mad when someone has an opinion you dislike unless you plan to bring evidence to the table proving otherwise. Your pro-cat post wasn’t exactly objective either. And if blinking VC, snap and pia/kiran was so good, a deck like that may have already existed with existing blinkers like eldrazi displacer and flickerwisp. Yet…they don’t except for fringe jeskai midrange decks. No Im not objective because I’ve tested almost 60 games with some competitive results. I’m not meaning to sound angry, I’m just dissapointed at the, “Well this is a waste of time.” Attitude. Remember the phrase Let it Go was used. That’s disappointing to hear to someone doing everything possible to test viability. Not that I’m mad even. Also when you add instant win to the potential, it may be much more playable/ competitive. I’m glad to see Thia coverage on aether revolts many new modern toys. I also think renegade rallier is a real undiscussed sleeper here, and I would be very happy to see Abzan climb back up the rankings, putting mire bgx police decks in tier 1. Srams expertise in BW tokens seems very very strong. Yahenni’s expertise coupled with fatal push enables some esper and UB strategies very heavily, especially alongside ancestral visions. I do believe there is enough reason to justify esper over jeskai control now. The problem is actually fitting it in and the tokens it creates. I agree that three tokens is good deal, but servos are worse than spirits. I don’t think that they’re the kind of token you really want, so for the main effect I don’t think that you’d play Sram’s Expertise. As for the second effect, I’ve never had problems when I played BW Tokens playing lots of spells or just flooding the board with tokens. The problem was actually turning them into wins and I don’t think Sram solves that. People will be trying it out, so I may be wrong. We’ll see. I agree that Yahenni’s makes sense in Esper, the problem is that I don’t know if you want it to. Again, the number of decks where -3/-3 is better than Destroy All Creatures is fairly small. Drawing three cards as well is good when you pull it off, but what about all the other cases? Yes, you can sweep small creatures and then kill a large one for four mana, but Damnation would have done that too. If you’re using it to place a threat or Liliana of the Veil, wouldn’t you want it in play before you sweep in a lot of cases? I’m just not convinced that the effect is enough to be worth the cost long term. The difference is esper is absolutely full of removal and countermagic. In my previous esper control build I only ran a single boardwipes because I found that when. You’re running path, slaughter pact, cut, countermagic and hand control, rarely does the field really flood effectively. Esper control almost never runs out of cards it’s more an issue of mana efficiency. Yahenni’s with no card cast is worse than supreme verdict. By a lot. Unless you have tasigur in play. However when you begin casting just about any spell (a lingering souls following the wipe is going to be extremely hard to beat) it solves more problems for esper than a hard wipe does. It allows you to immediately turn the corner and the prevent some haste effects or follow ups from leaving you open to death. Last night I used expertise into snapcaster to remove two birds of paradise and flashback thoughtseize to remove their next major play. Ancestral visions may be the BEST play with it but it’s been treating me extremely well. Sram is not what tokens wants. Tokens wants good ways to speed up its clock. Need to deal with Tron, Living End, Ad Naus. If it doesnt do that or is a strict upgrade to an existing card it doesnt want it. Those sort of lines, even if you replace procession with raise the alarm, lead to a decent amount of tokens, or cards in hand, or anthem effects. Its pretty easy to splash U for the Beck half, and allows you to play Beck + Raise the Alarm on 4 mana should you miss the combo. In addition, Windbrisk Heights casts Beck//Call too. My initial goldfishing went pretty smoothly, but as many before me have pointed out – i’m not sure how much it improves your bad match-ups. However, if it turns your 50/50 matches into 60/40 (whilst leaving bad match-ups bad), why wouldn’t you do that? Metallic Mimic would need testing but its an Anafenza without the color splash. Whats even better is the fact that you can now block etched champion in affinity. ( need all the help you can get ). I see some infect lists powering out BI with Thought Scour. Don’t know if it works better or worse than other pump spells. Maybe the best will be a mix of pump and scours. I can see infect still quite scary and as capable as before to win at turn 2 or 3. But it has to gamble a bit more to try to win on turn three or sooner while before it could go all-in without fearing removal so it’s just a virtual slow down. Expertises can be used to cheating a fuse spells on turn two (land mana dork, land expertise -> beck/call or breaking/entering) and that can be an interesting experiment ground. Interesting. That seems decent if you’re really going for Become Immense, but I’m skeptical of it actually being worth it. Wait and see I suppose. I’m sure they will. Cards like that are welcome additions to any brewing kit. I just have doubts that they will actually be good.